Reach over 8,000 community members each season at The Nutcracker and our Spring production. Our program books, website, and social media accounts reach a rapidly growing audience. Our printed Season Program is used across 8 mainstage performances during the year. Your ad in our 80+ page, glossy program book supports our mission-based educational dance programming and places you in front of thousands of potential customers who value the arts and support local businesses. When you advertise in our program, we’ll also include a text link from our website to yours. As an advertiser, you and a guest are invited to the VIP Reception and full dress rehearsal for both The Nutcracker and our Spring production. Demonstrate your support of the arts and arts education and make a great impression on thousands of audience members each season. Florence Paint & Decorating Center Inc.
Reach over 8,000 community members this season at The Nutcracker and Beauty and the Beast. Our website and social media campaigns reach a rapidly growing audience that could include your brand. The same 80+ page printed program is used for 8 performances. 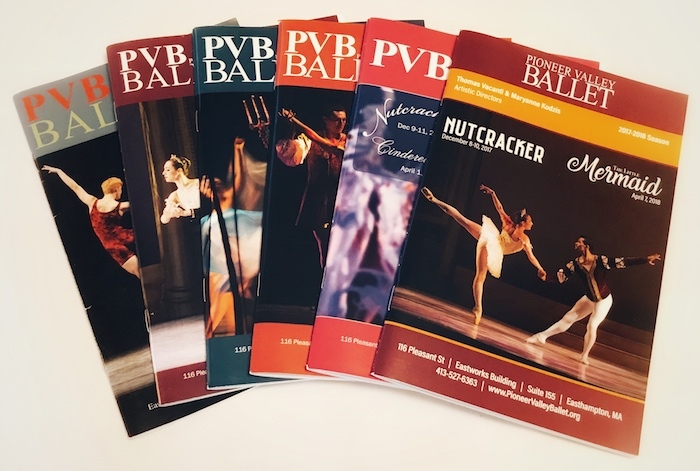 Your ad in Pioneer Valley Ballet’s program supports our mission-based educational dance programming and places you in front of thousands of potential customers. Your support of PVB also includes a text link from our website to yours. As an advertiser, you and a guest are invited to the V.I.P. Reception and full dress rehearsal for The Nutcracker and Beauty and the Beast. Send this form and press-quality PDFs by November 9, 2018. If full payment is received within 7 business days of submission of your ad copy, you will receive a discounted price as our thank you. Any ads PVB invoices will be billed at the full price. If you do not have this ready, you can email it to us by November 3rd. If you chose to pay online, you will be redirected to PayPal to process your payment. You do not need to have a PayPal account; you will have the option to pay with your credit card without creating an account. Pioneer Valley Ballet was founded in 1972. Our mission is three-fold: to foster an appreciation of dance on a regional level for local audiences, to give dedicated young dancers the opportunity to perform at a pre-professional level and to provide all children the opportunity to experience the joys of movement and music through the study of classical ballet. The Pioneer Valley Ballet (PVB) is a non-profit mission-driven organization.